LG has applied a metal-effect skin to the LG G3’s rear for a touch of class, but it is not actually metal. It is sufficiently stylish for a high-end smartphone. The rear cover of the LG G3 is removable, allowing you to access the also removable battery and microSDXC slot. The LG G3 is just 8.9mm – pretty thin by any measurement, especially considering the extra tech that is squeezed in. At 75 x 146mm in size, the G3 is a large phone due to its bigger screen size compared to its predecessor and other flagship devices. 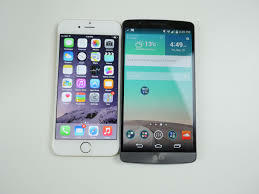 By contrast at 138.1 x 67 x 6.9 mm the iPhone 6 is certainly not a small phone, but it is uncommonly thin, and smaller than the LG G3 in general. The iPhone 6 is a very different device from the iPhones of the past four years. The new phones have rounded edges – not just the metal, but the edges of the glass front are curved. This and the overall thinness make it a very comfortable fit in the hand. It’s no surprise that the LG G3 has gained some weight considering its overall size but not much at all, 149g up from 143g. More impressive design work from LG. The LG G3 feels big enough and ugly enough to look after itself, too. By contrast the iPhone 6’s 129 g is very light for a larger-screen smartphone: much as you would expect from Apple. If you want a big-screen handset with a smaller chassis, you are going to choose the iPhone over even the LG. Both handsets offer colourful options, but neither the LG G3 nor the iPhone 6 comes with any dust- or waterproof credentials. It’s unsurprising that performance is smooth and nippy. It is certainly a powerful and fast performer. As, of course, is the iPhone 6 – despite nominally inferior hardware. The iPhone 6 comes with an Apple A8 processor – a dual-core chip running at 1.4 GHz. And it has only 1GB RAM. So if we were comparing only on pure processing power we’d have to hand the prize to LG. Of course it is more nuanced than that. Both of these handsets are super fast performers, both in terms of real-world use and in synthetic benchmarks. I cannot imagine anyone finding either of them slow. Much more important than pure processing power is user experience, which also takes into account software coding. And in that respect both of these handsets are at the pinnacle of moddern smartphone technology. None the less, if you are the sort of user who requires the fastest chip and the most RAM, it is the LG G3. The resolution of the G3 remains at 13Mp compared to the G2 but there are a number of improvements which have been added. For starters there’s a dual-LED flash which should come in handy in low light situations. More impressive is the inclusion of recording video in 4K resolution. That’s not a new feature for smartphones but the LG G3’s laser auto focus certainly is. The G3 includes optical image stabilisation technology to keep shots shake-free and something called ‘touch and shoot’ removes unnecessary buttons so you can concentrate on getting the right shot. At the front is a 2Mp camera which can shoot video in Full HD which LG calls a ‘selfie camera’, not a front facing camera. However, LG has added the ability to take selfies with a hand movement. The pixels are bigger than the rear camera, the angle has been optimised for selfies and the screen can be used as a sort of flash in dark conditions. Apple has clearly eschewed the megapixels arms race in speccing up the cameras for the iPhone 6. Whether that is a good- or a bad thing remains to be seen. The main, rear-mounted camera is an 8Mp snapper that captures 3264 x 2448 pixel images. It has a 1/3in sensor, and offers face-detection, autofocus, and a dual-LED flash. Video is captured at 1080p and 720p, at 60fps and an amazing 240fps slo-mo. Iphone takes back that lead in connectivity.Both are 4G phones, with theLG supporting more bands for roaming but the Note 4 theoretically faster with Cat 6 (up to 300Mb/s) rather than Cat 4 (up to 150Mb/s) 4G. The pair also support 802.11ac Wi-Fi (2×2 MIMO for Samsung), Bluetooth 4.0 (4.1 for the Note 4) and GPS. TheLG adds MHL, an IR blaster and Samsung’s Download Booster, which combines the power of 4G and Wi-Fi for faster downloads. When it comes to a straight up spec comparison, the LG G3 may edge out theÂ Phone 6. However, itâ€™s impossible to call it until weâ€™ve laid hands on the iPhone 6 for a week or so. The resolution and processing power outpace the iPhone 6 and the connectivity and design are comparable. The iPhone 6 finds its legs in a good design and the soon-to-be launched iOS 8. While not revolutionary or groundbreaking, the iOS experience will be enhanced via the iPhone 6. Â However, the bottom line here is this: The G3 gives you a terrific processor and camera for less money.